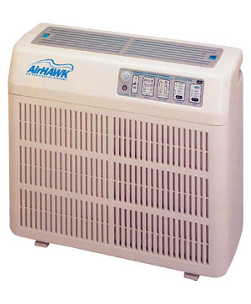 AirHAWK AH 265 units are portable/free standing and have the same filtration features and high level of particulate and germicidal protection as AirHAWK's larger units. It incorporates Photo-Catalytic Oxidation to convert toxic compounds, even carbon monoxide and nitrous oxide, into benign constituents such as carbon dioxide and water. The AH 265 has computerized controls with four modes of operation and seven room sizes to ensure energy efficiency through proper room sizing. A sensor detects toxic chemical fumes, high particulate counts, and gas leaks. Inlet and outlet grills with safety locks. Prefilter cleans air of particles larger than 5 microns. Two gas absorption layers remove toxic chemical and gases. Hospital grade filter removes allergens: pollen, mold, fungal spores, etc. Quiet reversed-curved, motorized impeller with sealed ball bearings. Construction is high-impact ABS plastic. High output germicidal UV lamp kills viruses and bacteria.